Ales of the Riverwards: Gose or Hefeweizen, why not both? Gose or Hefeweizen, why not both? My Son's first birthday was this past weekend, and due to the season we decided to throw a little Oktoberfest themed party. Of course I was going to have to brew the beer for the event, but the problem for me is German style beer isn't exactly my wheelhouse. The only real German styles I brew are Gose and Berliner Weisse, which might be a dangerous pour when over half the crowd are BMC drinkers. However we did invite a bunch of friends and family who are beer fans so I tried to come up with something that would satisfy varying palates and fit the theme of the party. I recently started using a brew bag to line my mash tun, super easy clean up. I struggled to think of one style that I could brew for the event that I felt I could execute well and still challenge myself all while pleasing the guests of the party. 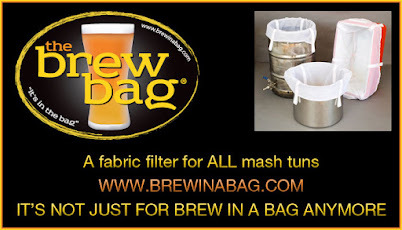 If I was a lager brewer this would be much easier, a nice Helles or Pilsner would be perfect, both of which are styles I love to drink but dont have much desire to brew at the moment. So, in lieu of finding the one style to rule them all I decided on a split batch where I could pour two different beers from one mash, a Hefeweizen and a Gose. Both having a pretty similar grist but quite different flavor profiles. I will admit, however, the Gose was a self-serving choice. Hefeweizen may not be my favorite style in the world but I've had some in my day that I enjoyed quite a bit. What works best for me in the style, for which I am no expert, is a subtle fermentation character, no banana at all, with maybe a late boil hop , style guidelines be damned. The grain bill I used was a simple 60/40 Pils/Wheat split, which works perfectly for both the Hefeweizen and the Gose. I no sparge mashed enough for a 10 gallon batch then collected all of the runnings in my main boil kettle and lit the flame. Once the runnings hit a boil I transferred ~5.5 gallons over to another kettle for the Gose while I hopped the remaining wort for the Hefeweizen and boiled for 60 minutes. I chose to toss 1.00 oz of Hallertau Blanc in with 5 minutes on the Hefeweizen, then finish it off with SafBrew WB-06. I want to see two boils (dragons). The Gose I boiled in the separate kettle for a total of 5 minutes without hops, the point here is that I want to sterilize the wort so that I rely on my choice selection of Lactobacillus Plantarum to sour, as I've done in the past. I know some folks choose to either just run off the mash or push the wort to 180F to sterilize but I like to be sure I am sterile and reliant on the Lacto pitch for acid creation. 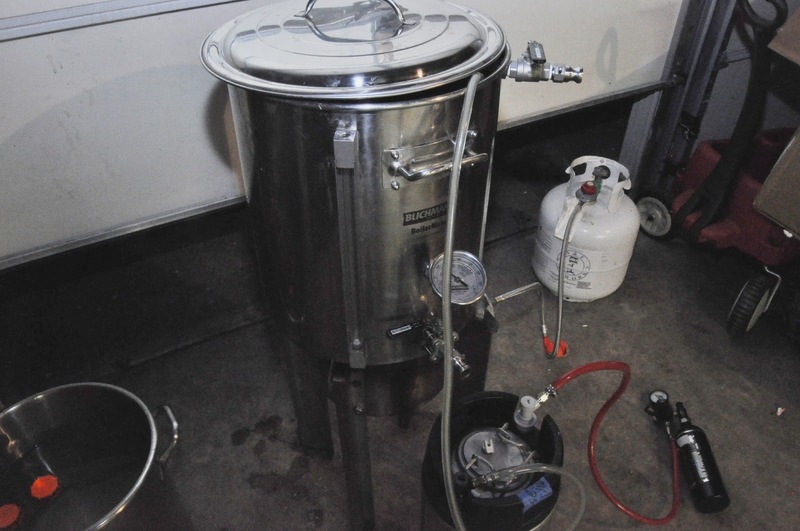 Once the 5 minute boil was finished, I chilled to 100F and transferred into a clean, sanitized, o2 purged corny keg where I pitched an entire 24oz carton of Goodbelly Lemon Limeade. In the past I've relied on on pure culture Lactobacillus Plantarum via Swanson Probiotics but since Devin Bell and other folks on Milk The Funk have had success with Goodbelly I figure I would give their L. Plantarum a shot. The 24oz should contain plenty of cells of Lactobacillus to sour the wort and maybe the Lemon Limeade flavor might add a little extra to the flavor profile in the end. Into the keg @ 100F. Wort cooled down a few degrees once it hit the cool keg. I held the corny keg at 90F for 48 hours to sour, Plantarum is really a great isolate to use for kettle sours as it creates acid at a much cooler temperature than most other cultures. After the 48 hours I hooked up a picnic to pull a sample to ensure the wort was sufficiently sour before performing another boil to kill off the lacto. I'm usually anti bacteria murder but I wanted a bit more consistency with this batch. After the full 48 hours the beer was 3.38pH, and was tasting about as sour as I had hoped it would. I transferred the souring kegs contents into my kettle and boiled it for another 5 minutes where I hopped it with 1.00 oz of Hallertau Blanc (see a theme here? I love this hop) as well as adding 1.50 oz of Pink Himalayan Sea Salt and 1 oz of muddled Coriander. The wort was chilled and transferred into a stainless kettle where I performed primary fermentation in a semi-open environment with Danstar Munich Wheat (a convenient HomebrewCon freebie). Both beers were kegged 2 days before the party and burst carbonated, all total the turnaround was 12 days for both beers. Pushing beer from the souring keg to the kettle to boil, it was taking too long so I just dumped it. I am going to forgo a more structured tasting of the two beers in favor of some brief words on them. The Gose, I loved, and apparently so did the party as that beer kicked and the Hefeweizen did not. With aromas of light fruit and some underlying spice notes it made for a pretty unique smelling beer that's likely not classic to style Gose but I dont much care. The acidity hit upfront then gave way to a pillowy body that I really liked but some people mistook for being under carbonated. The finish was quick, refreshing and left a nice pucker and saline character in the back corners of your throat, with notes of Lime which may or may not have been because of the juice. A few people compared it to a lemon lime margarita, which I totally get and really dig. My wife made me some fancy tap signs. The Hefeweizen turned out pretty well to, it's relatively clean as far as a Hefe goes, some light clove aromatics, low hop bitterness and a really fluffy body from all that wheat. Its an easy drinker and I think some people enjoyed it, but for me I went back to the Gose more frequently, and the trips were maybe too frequent on the day. Upon first sip of this I always like it more than I do after each sip, I just keep wishing it was a Saison. Im looking for the dry, bitter hops, or spicy finish to wrap it all up. But in the end I'm just left wanting a bit more, especially hops. But these aren't hallmarks of the style, and likely why I dont brew them often. But for a split batch when you spend one brewday and get two very different beers it worked out well for me, and fit the Oktoberfest bill for this Saison and IPA brewer. Prost! No Sparge, mashed with full volume of water. Hefeweizen Recipe Specs: Boiled separately from Gose. Gose Recipe Specs: Boiled separately from Hefeweizen. Misc: Cherry Hill, NJ Tap water. Mash pH 5.32, Water Profile ( 88ppm Ca, 6ppm Mg, 10ppm Na, 82ppm Cl, 101ppm SO4). Some Lactic acid was used to lower the mash pH, your water profile may vary. Full volume mash for both beers, ran off entire no sparge mash into one boil kettle, then split off 5.5 gallons for a separate 5 minute boil for the Gose. Hefeweizen was boiled for 60 minutes and hopped as detailed above. Gose a total of 10 minutes, 5 minutes unhopped prior to kettle sour (3.38pH) then another 5 minutes where hops were added once sufficiently sour, then fermented out cleanly. I tried making my first gose this past Sunday. Dropped the temp in my Grainfather to 110 and put in 2 of the Goodbelly mango plus shots. I opened the kettle after 48 hours and it doesn't look like anything happened. I'm using the ph strips to check and I'm not thinking that the ph went down. Did I go too high on the temp and should the wort show any foam or anything like when you pitch yeast? How did you hold your keg temp for 48hrs? Heat blanket? Temp probe? Sorry for the slow reply. I use an electric heating pad (foot warmer) via amazon, works very well. See this link. I do about 30psi for 24 hours, then down to serving pressure. Thats gets me on the way and after 3-4 days at serving temps its fully carbonated. Brulosophy has a great post about their quick carb method. Hi Ed, just to clarify did you leave the Gose at your Mash ph of 5.32 or did you lower it to 4.5 with acid before you pitched the Lacto in the corny? Trying your method this weekend!